Thank you I Can’t Believe It’s Not Butter! for sponsoring this post. Visit www.icantbelieveitsnotbutter.com for more information about Breakfast After Dark. We love breakfast for dinner (or “brinner” as it’s often called), whether it’s waffles, pancakes, egg scrambles or frittatas. 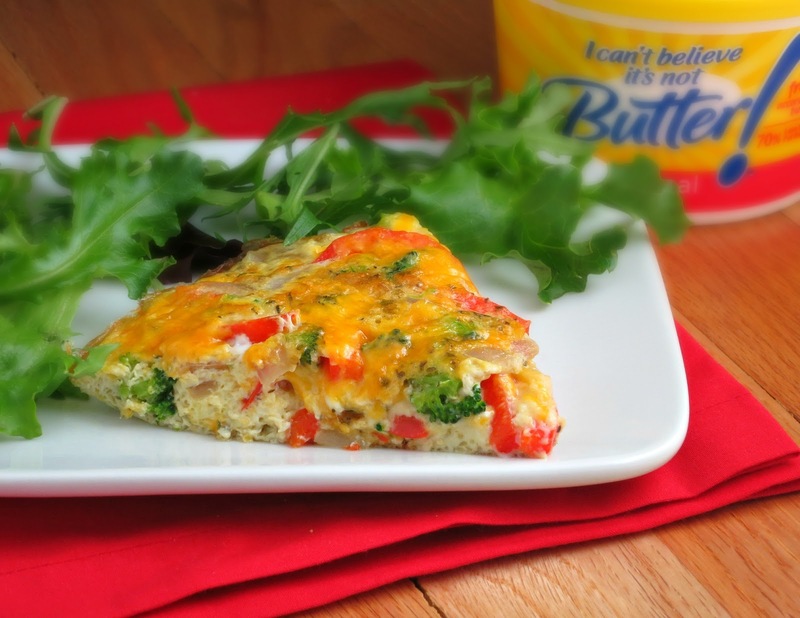 This Easy Vegetable Frittata is a frequent “go-to” dinner because it’s quick, easy, and we can easily use up whatever vegetables or cheeses we have on hand. Mike can make it too, which is another plus! In this frittata, for the veggies, I used sliced red pepper, chopped broccoli florets, chopped red onion, and some garlic, and I used cheddar for the cheese. It was such a delicious combination and so colorful! I paired my frittata with a mixed green side salad, because that’s generally what I have with any dinner. Mike skipped the salad and enjoyed his with a beer ~ it is dinner after all! 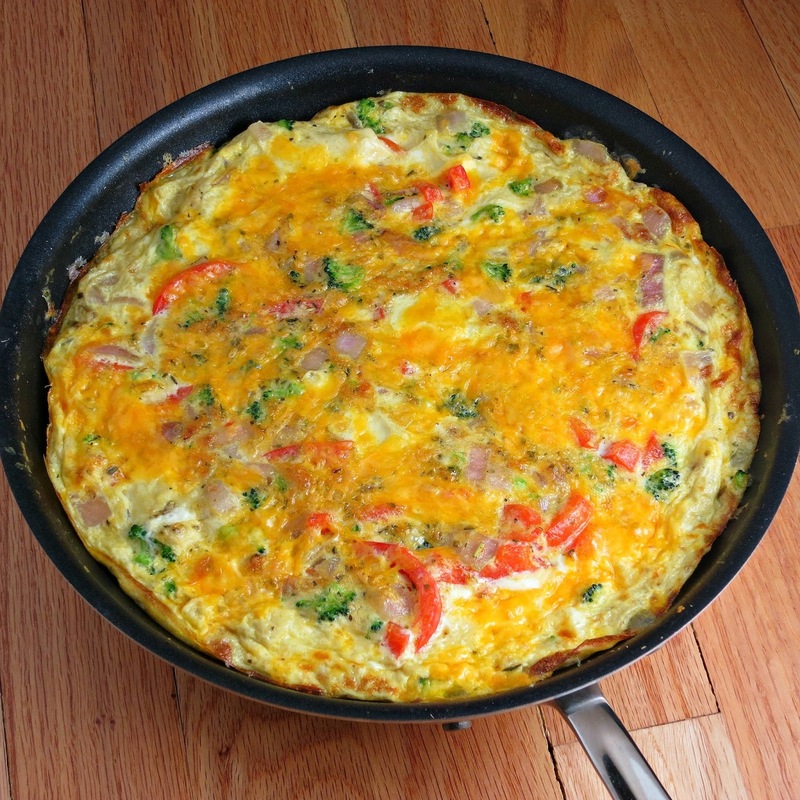 With Mother’s Day just a few days away, this frittata would be an excellent dish to enjoy at your celebratory breakfast/brunch or for a breakfast for dinner. Tomorrow I will be sharing another great brunch recipe…and it’s even easier to make! In a large oven-proof nonstick skillet, melt 1 tablespoon I Can't Believe It's Not Butter! over medium heat. Add your vegetables and cook, stirring occasionally, until vegetables are tender (about 5 minutes). During the last minute, add minced garlic and Italian seasoning, stirring to combine. Meanwhile, melt the remaining tablespoon of I Can't Believe It's Not Butter! In a large bowl, whisk the eggs, melted I Can't Believe It's Not Butter! and 3 tablespoons water for about 1 minute, or until frothy. Stir in ½ cup cheese. Top with remaining cheese and broil for 2 minutes, or until cheese is melted and golden brown and eggs are set. Cut into wedges and serve. Source: I Can’t Believe It’s Not Butter! I’ve never heard of brinner before. That’s gold.